To Cite: Salehi M, Dehghan Manshadi S A, Yassin Z, Hassannejad M. A Simple Approach for Diagnosis of Chronic Tuberculous Osteomyelitis: A Case Report, Arch Clin Infect Dis. 2017 ; 12(2):e57281. doi: 10.5812/archcid.57281. Introduction: Osteomyelitis is a secondary complication in 1% to 3% of patients with pulmonary tuberculosis (TB). Definite diagnosis of TB-associated osteomyelitis is challenging for clinicians, as biopsies of deep osteoarticular tissues are necessary. Case Presentation: We present the case of a 50-year-old man, admitted to Imam Khomeini hospital, Tehran, Iran in March 2014. According to his self-report, he had a chronic ulcer on his left foot since September 2012. In physical examinations, there was a painful sinus tract orifice (2 × 2 cm) on the left medial malleolus. Magnetic resonance imaging (MRI) of the foot revealed osteomyelitis in the left ankle. Two biopsies were taken from the wound edge, and Mycobacterium tuberculosis was detected via polymerase chain reaction (PCR) assay. Conclusions: Today, in the diagnosis of TB-associated osteomyelitis, it is a common practice to obtain 3 osteoarticular tissue biopsies for microbiological evaluation, PCR analysis, and histopathological assessment. We suspect that biopsies from the edge of the sinus tract orifice may help diagnose TB osteomyelitis. Prior to the emergence of human immunodeficiency virus (HIV), 85% of tuberculosis (TB) cases were pulmonary, while the remaining 15% were either extrapulmonary or both pulmonary and extrapulmonary. Extrapulmonary TB has been observed in more than 50% of patients with concurrent AIDS. Any organ can be involved in extrapulmonary TB (1-3). However, the common sites include the lymph nodes, pleura, bones, and joints. Osteomyelitis is a secondary complication in 1% to 3% of patients with pulmonary TB. In this complication, Mycobacterium tuberculosis generally spreads into the bone through blood circulation. The organism initially infects the synovium due to its higher oxygen concentration and then extends to the adjacent bone. All bones have the potential to be involved in TB osteomyelitis. However, long bones and vertebrae are common sites for microorganisms (4). Negative acid-fast bacteria smear, lack of granulomas on histopathology, and negative culture of bacteria cannot necessarily exclude the diagnosis of extrapulmonary TB. Novel methods, such as nucleic acid amplification (NAA), are useful in diagnosing different forms of extrapulmonary TB (5). NAA test (NAAT) is also suitable as an adjunct to mycobacterial culture, since culture results can be determined in at least 1-2 weeks, whereas NAAT can be performed within hours, thereby facilitating early diagnosis and treatment (6). A 50-year-old man was admitted to Imam Khomeini Hospital (a governmental referral hospital), Tehran, Iran in March 2014. Based on the patient's self-report, he had a chronic ulcer on his left foot since September 2012. In physical examinations, there was a painful orifice (2 × 2 cm) on the medial malleolus in the left foot with hyperpigmentation in the surrounding skin (2 - 3 cm), without any erythema, warmth, or discharge. However, the ankle was swollen and tender, and its range of motion was limited (Figure 1). Other symptoms included weight loss, anorexia, malaise, and night sweats. The patient also reported a history of blunt trauma on the left foot without fracture almost 2 years before hospital admission. Also, ankle arthritis and suspicious rheumatoid arthritis in the same foot had been diagnosed a year ago. Ankle arthritis was treated with prednisone, methotrexate, and sulfasalazine, as prescribed by a rheumatologist. After 3 months of treatment by a rheumatologist, arthritis in the left ankle deteriorated, with an increase in swelling and pain. After some time, a nodule developed at the wound site, and the wound changed to ulcer with occasional discharge. MRI of the left foot revealed diffuse osteopenia, soft-tissue swelling, and osteomyelitis. In addition, tuberculin skin test result was 30 mm. 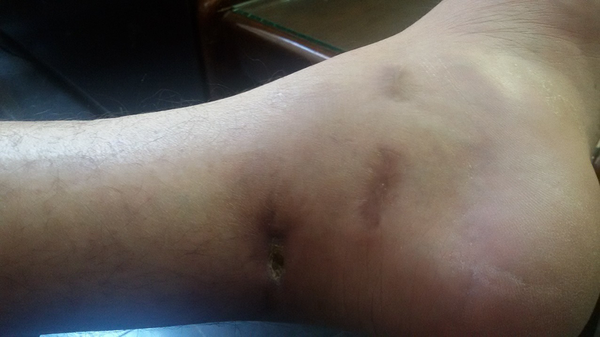 Ankle surgery was scheduled for the patient after orthopedic consultation, but the patient did not consent. Therefore, 2 biopsies from the wound edge were taken and sent for smear and culture studies, PCR, and histopathological investigations. PCR was positive for M. tuberculosis, and histopathological evaluations revealed chronic granulomatous inflammation without necrosis. In addition, mycobacterial culture and smear findings were negative. Finally, the patient was treated with a standard anti-tuberculosis drug regimen (ie, isoniazid, rifampin, pyrazinamide, and ethambutol) and was visited monthly for 9 months. In each visit, images were acquired with a camera from the foot ulcer and were compared to investigate the possible changes. After 2 months of treatment, the foot ulcer dramatically improved (Figure 2). Diagnosis of extrapulmonary TB is elusive and complicated. The number of bacilli in extrapulmonary samples is normally lower than pulmonary TB. Microscopic visualization of M. tuberculosis is traditionally performed by acid-fast bacilli staining (Ziehl-Neelsen stain). Moreover, M. tuberculosis complexes are microorganisms, which grow at a very slow rate and may survive for 3 - 8 weeks in solid media (5). Although the US food and drug administration (FDA) recommends that PCR should be performed only for rapid diagnosis in respiratory specimens, nucleic acid amplification (eg, PCR) is found to be a sensitive and highly predictive method for the diagnosis of TB. This method is more efficient when there is a high clinical index of suspicion for TB, along with a negative acid-fast smear (7, 8). Definite diagnosis of TB-associated osteomyelitis is challenging for clinicians, as biopsies are necessary from deep osteoarticular tissues. In the conventional approach, most patients are diagnosed, based on clinical suspicion and imaging patterns. Today, 3 osteoarticular tissue biopsies are recommended for microbiological evaluation, PCR, and histopathological assessment for the diagnosis of TB-associated osteomyelitis (2, 9). In conclusion, biopsies from the edge of the sinus tract orifice may help diagnose TB-associated osteomylitis, especially in patients who cannot tolerate surgical procedures for any reason. However, more than 1 case should be reported to rely on the sensitivity of this approach.